Come Halloween, youngsters’ attentions are understandably focused on costumes and candy. 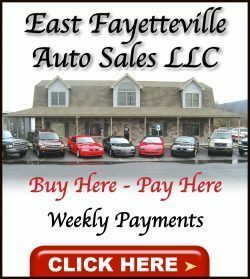 Their parents, however, are likely more concerned with their kids’ safety. Trick-or-treating kids might not pay much mind to safety. As a result, it can be hard for parents to get kids to grasp the importance of being safe on Halloween. The following strategies might make that task easier. • Discuss costumes well in advance of Halloween. Many kids are so enthusiastic about Halloween that they know which costumes they hope to wear long before October 31. Parents can discuss potential costumes well in advance of Halloween before kids even know what they want to wear. Doing so gives parents a chance to encourage kids to choose bright costumes that will make them more visible to drivers on Halloween night. Waiting to discuss costumes increases the likelihood that kids will already have an outfit in mind, making it harder for parents to convince them to choose something safe. • Explain that some tailoring might be necessary to make gathering all that candy a lot easier. Superman doesn’t trip on his cape in the movies, and youngsters dressed up as the Man of Steel shouldn’t trip on their capes, either. When kids pick costumes, explain to them that you might need to do some tailoring before they go trick-or-treating. Explain to kids that costumes should be trip-proof so they can seamlessly go from house to house in search of their favorite goodies. • Create a bag or bucket design day. Depending on what kids will use to carry the candy they accumulate this Halloween, parents can plan a bag or bucket design day a few days in advance. 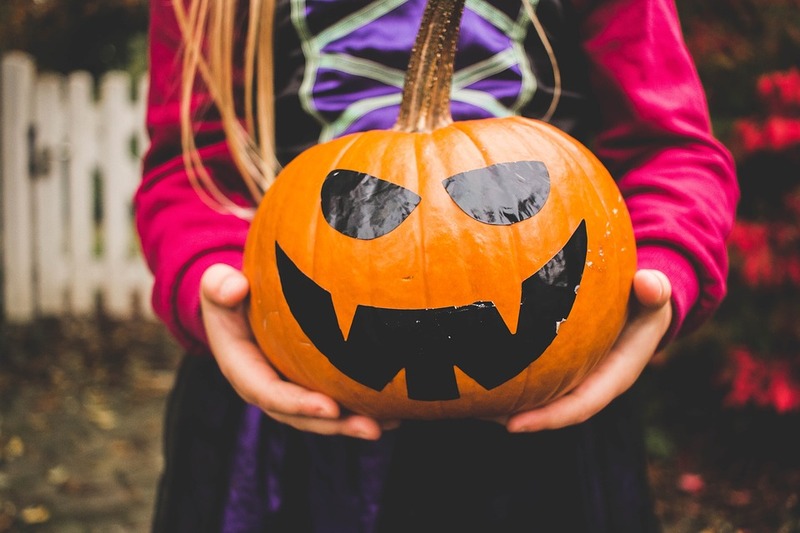 Kids will enjoy this chance to get in the Halloween spirit, and parents can encourage youngsters to decorate their bags and buckets with reflective tape that will make them more visible to drivers. • Talk up trick-or-treating with friends. As Halloween approaches, parents can discuss how much fun kids will have going door-to-door with many of their friends. This is a good way to ensure kids trick-or-treat in large groups, making them more visible to drivers. In addition, kids trick-or-treating in large groups might be too busy joking with their friends to notice when one or two parents tag along as chaperones. Parents can discuss Halloween safety with their children in ways that make it fun to be safe while trick-or-treating. 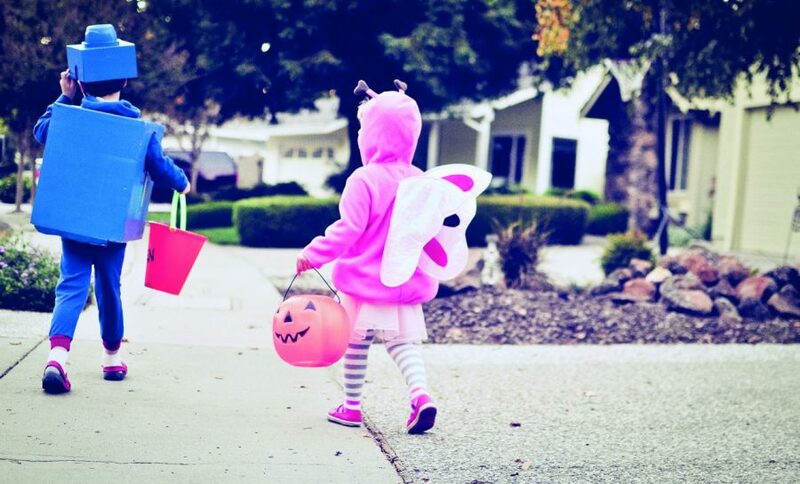 Thousands of costume-clad children will embark on treat-finding missions in neighborhoods all across the country this Halloween. Everyone wants their Halloween festivities to be fun, but it is important that trick-or-treaters and their chaperones prioritize safety as well. The child welfare organization Safe Kids says that twice as many child pedestrians are killed while walking on Halloween compared to other days of the year. 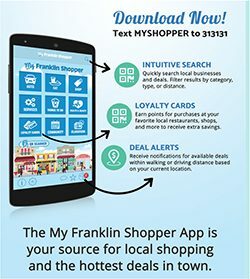 In addition, the National Safety Council states that darting out or running into the road accounts for about 70 percent of pedestrian deaths or injuries among children between the ages of five and nine and about 47 percent of incidents for kids between the ages of 10 and 14. Ensuring trick-or-treating youngsters are visible to motorists can make Halloween safer for everyone involved. The American Academy of Pediatrics and other safety groups suggest the following strategies for safe trick-or-treating. · Supervise the festivities. Adults should chaperone young trick-or-treaters who are unlikely to be focused on safety in the midst of Halloween excitement. · Use reflective tape or LED lights. Dark costumes coupled with twilight can make it difficult for motorists to see trick-or-treating youngsters. Parents can improve the chances of their kids being seen by motorists by adhering reflective tape onto kids’ costumes. 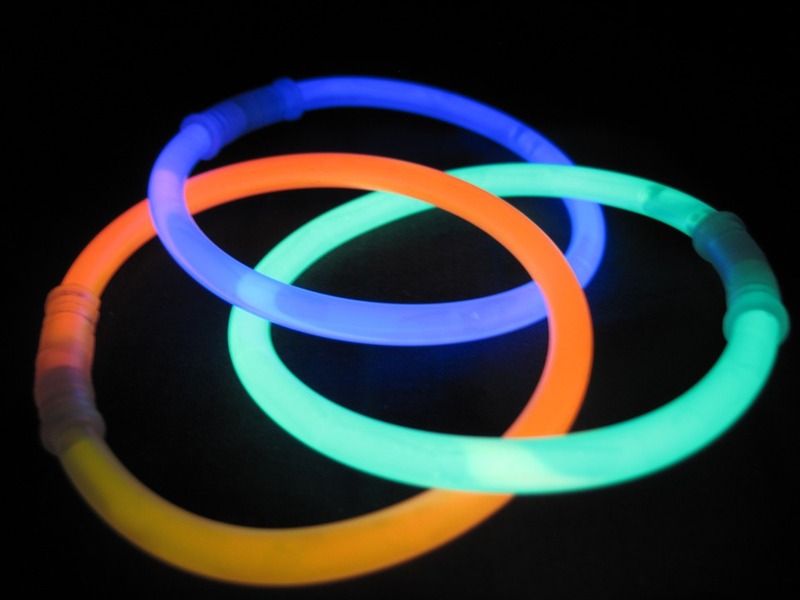 Glow sticks and wearable LED lights also can illuminate trick-or-treaters. · Carry lanterns or flashlights. Children and/or chaperones who carry flashlights and lanterns can improve their own visibility while also making themselves more visible to motorists. Lanterns and flashlights help trick-or-treaters avoid holes, cracked pavement and other obstacles. For those children who want to free up their hands for better treat gathering, lights that strap to the head are an option. · Keep the lights on. Homeowners can do their part by keeping outdoor flood lights and accent lighting on to make paths safer for youngsters on the prowl for Halloween candy. · Choose face makeup over masks. Children wearing masks may not spot oncoming cars or other hazards. Face makeup won’t affect kids’ visibility but will still help them look scary. With the right combination of caution and fun, Halloween can be an enjoyable time for youngsters and adults. Halloween is a special day that delights children of all ages and helps adults feel like kids at heart. Few people want the fun to end once trick-or-treating is over. By throwing a Halloween party, revelers can continue celebrating well into the evening. When hosting a Halloween party, it helps to determine who will be in attendance before making any plans. Parties that include children should be PG in nature, and hosts should find the right balance between scary and fun. While you want to have a certain measure of the macabre, make sure you don’t send young guests home with nightmares. Reserve gruesome decorations and details for adult-only parties. Halloween parties do not necessarily need to be ghoulish to be fun. Try a glittery gala masquerade party or decorate exclusively in orange and black. Classically eerie parties may feature ravens and crows, or they can be subtly spooky with red candles and heavy curtains. Many people can’t wait to dress up for a Halloween party, even picking out their costumes months in advance. Still, not everyone feels comfortable donning a costume. To welcome all guests, don’t make costumes mandatory. One way around this is to set up a Halloween Disguise Table full of accessories that anyone can borrow and use to alter their appearance. Goofy glasses, strange hats, adhesive mustaches, or masks can be fun. If someone didn’t feel comfortable dressing in full costume, he or she may be more apt to pop in a set of plastic fangs or put on a spinning bow tie. 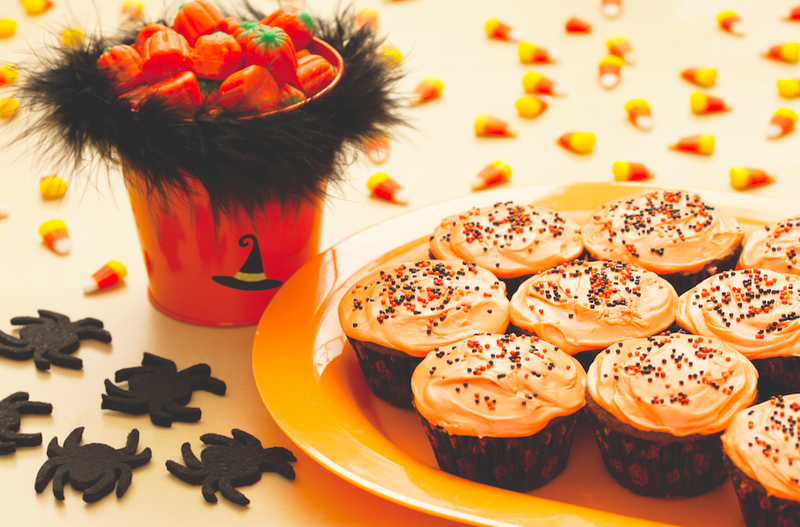 Food is an integral part of any party and can enhance Halloween soirées. Candy is a pivotal component of Halloween and you can play off that theme at your party. Set up a candy bar full of appropriately hued candies of all shapes and sizes. Put them on display in clear glass or plastic canisters so they add to your Halloween décor. 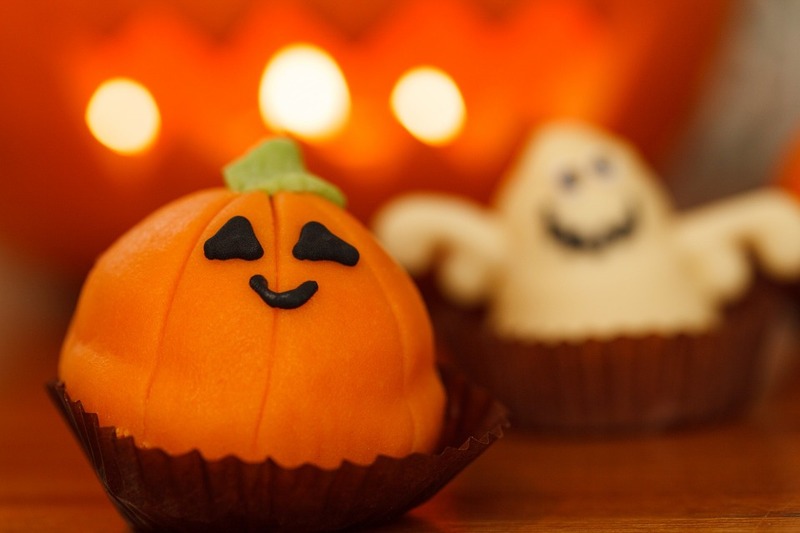 Some people like to get creative with Halloween cuisine, crafting foods into items that may look like parts of the body or other symbols of the holiday. Cookie cutters can turn sandwiches, desserts, biscuits, and many other foods into different shapes. However, foods also can be made a tad more spooky simply by renaming them or presenting them in interesting containers. Why not serve punch out of a fish aquarium? Other beverages can be housed in jugs or old bottles and labeled “potions.” Use laboratory instruments, such as petri dishes, vials and beakers, to serve snacks. A Halloween party makes for a fun night, and there is no limit to what hosts can do when planning their scary soirées. 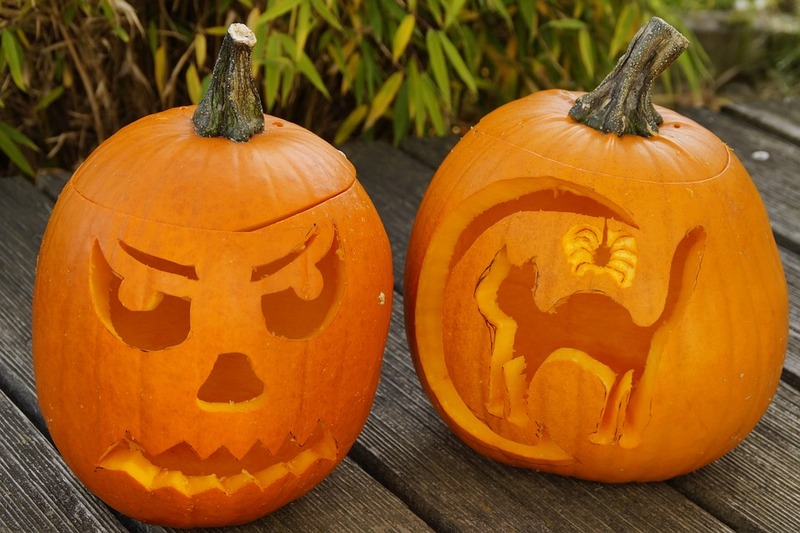 Transforming pumpkins into cleverly carved creations is a Halloween tradition. Each October, glowing pumpkins take up residence near doorsteps and porches, adding to the magical ambiance of the season. Young and old spend time designing their themes and then taking knife to pumpkin to achieve the desired effects. Carving pumpkins into jack-o’-lanterns can be traced back centuries to Ireland and a story about “Stingy Jack.” The tale involves Jack outwitting the Devil twice, the second time freeing the Devil from a prank in exchange for the promise that he would not claim Jack’s soul should Jack die. When Jack did die, God did not want the unsavory character in heaven, but the Devil could not claim Jack for hell. Therefore, Jack was relegated to roam the planet indefinitely with only a burning coal to light his way. Jack put that coal into a carved-out turnip. His ghostly figure was referred to as “Jack of the Lantern.” Later on it was shortened to “Jack O’Lantern.” When Irish immigrants arrived in North America, turnips weren’t plentiful, so jack-o’-lanterns were instead carved into pumpkins. Today, many people carve jack-o’-lanterns, with some featuring just smiling or grimacing faces while others are far more artistic creations. 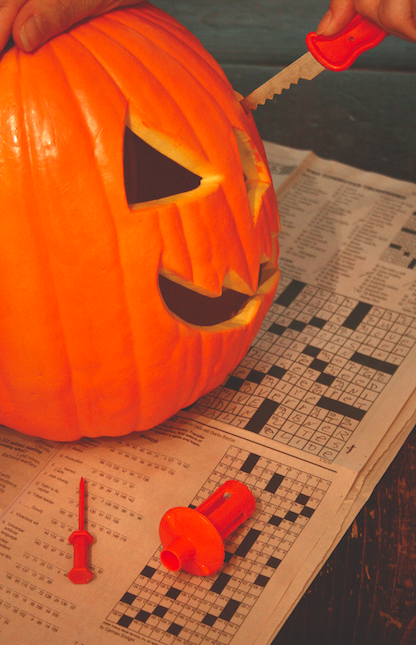 These tips can help anyone carve a pumpkin. · Begin with a fresh pumpkin. Look for a pumpkin with a green stem. If the pumpkin has been sitting around for too long or has been handled too much, the stem can get brittle and/or fall off. A thick, fresh pumpkin is best for carving. · Plan your ideas. Draw a plan for your pumpkin before you make your first cut. Then transfer that design to the pumpkin with pen or a thin marker. Pumpkin-carving kits come with designs that can be “traced” by poking small holes to create the outline of the design. · Don’t cut all the way through. Many professional pumpkin artists do not actually cut clear through the flesh of the pumpkin. They carve and shave off layers of the outer rind until it becomes more translucent. The level of transparency can be adjusted based on how much skin is removed and as a way to add texture and shadowing. The more air that is allowed to penetrate the pumpkin, the faster it will start to degrade. · Delay carving until the last minute. Wait until the day before Halloween to begin carving. Pumpkins are a perishable item, and they’ll begin to rot as soon as you begin carving. Spritzing them with water can help them stay fresh, but there’s no turning back the clock once the first cut is made. · Cut a hole in the back. According to Brooklyn-based Maniac Pumpkin Carvers, cutting off the top of the pumpkin can affect its structural integrity and cause it to rot faster. Instead, cut a hole in the back of the pumpkin and use an electric light to illuminate it. LEDs are advisable because they don’t generate much heat, which can cook and rot the pumpkin from the inside out. With some creativity and a little know-how, anyone can create an eye-catching jack-o’-lantern. 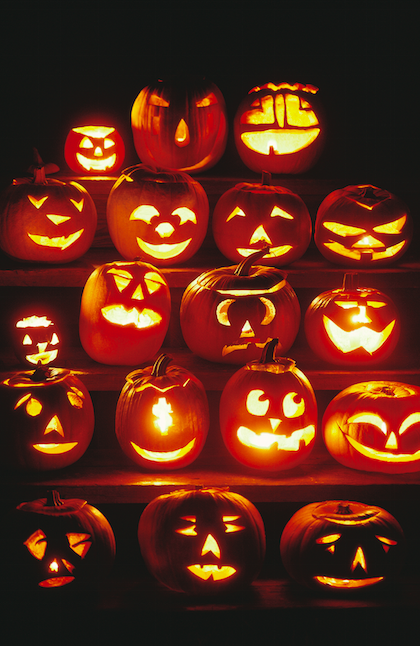 Jack-o’-lanterns and other carved pumpkin designs are frequently the centerpieces of Halloween festivities. The twinkling lights and orange glow of jack-o’-lanterns can add ambiance to any autumn event. The trouble with carving pumpkins is that most people want to do it right away, only to discover their pumpkins wilt and decay long before Halloween. Nothing ruins Halloween more than visiting a home to trick-or-treat and not getting candy. Equally disappointing is a sad pumpkin display withering away on a front porch. Even though all pumpkins will eventually rot, certain tips can keep carvings from collapsing too soon. · Choose a sturdy pumpkin. Inspect the pumpkin of your choosing carefully, looking for gouges, spots and holes. Even a small blemish can quickly expand into a mushy mess. Select pumpkins with even color and firm flesh, and make sure that the pumpkin doesn’t feel tender when you push on the skin. · Visit local pumpkin stands. Pumpkins that have been shipped miles and miles in hot cargo trucks may be overly ripened or battered. Pumpkins that were grown nearby may be fresher. Plus, buying pumpkins locally supports local farmers. 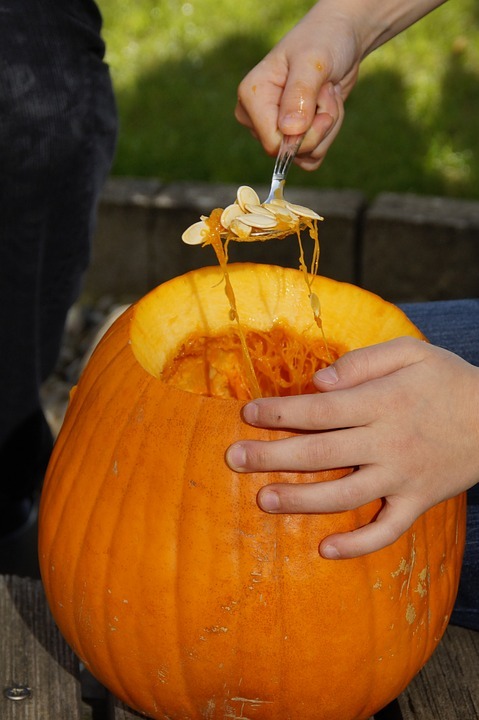 · Scrape the insides of the pumpkin thoroughly. Any moist bits inside the pumpkin will mold quickly. 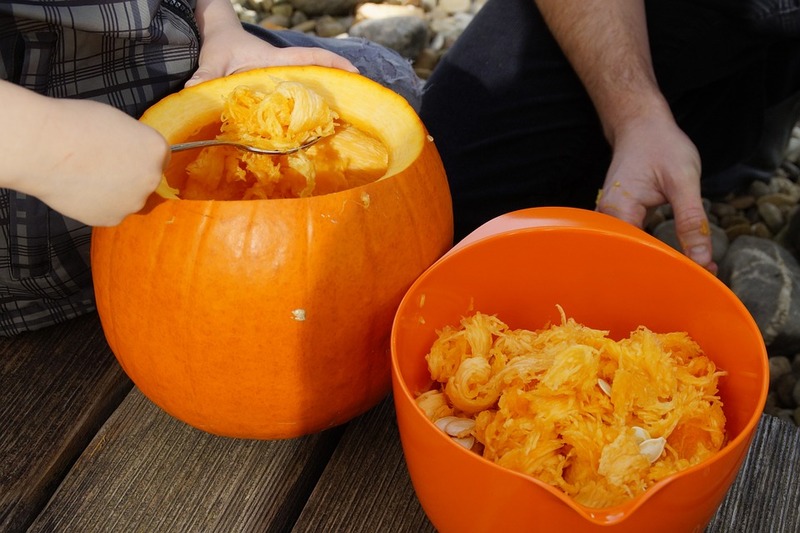 The pumpkin carving experts at Pumpkin Masters recommend scraping as much of the “guts” out as possible, leaving about a one-inch thickness of the wall of the pumpkin. · Coat the pumpkin. Preservation methods may aim to keep the pumpkin hydrated and inhibit mold and other microbial growth. Commercially sold pumpkin preservation products, such as Pumpkin Fresh®, hold up well. Soaking and spraying carved pumpkins with a bleach-and-water solution also seems to preserve designs. · Keep it out of the elements. Store carved pumpkins in a cool, dry place. This will help slow down the rotting process for pumpkins exposed to outdoor fungi, other microbes and warm sunlight. · Use an artificial light source. Reduce the heat inside of the pumpkin and encourage hydration by selecting a battery-powered light instead of a lit candle to illuminate the carving. · Skip the carving. Once pumpkin skin is compromised, microbes can enter. In lieu of carving, paint or decorate pumpkins in other ways if you want them to stay fresh for a long time. Glow in the dark paint can help pumpkins stand out at night. 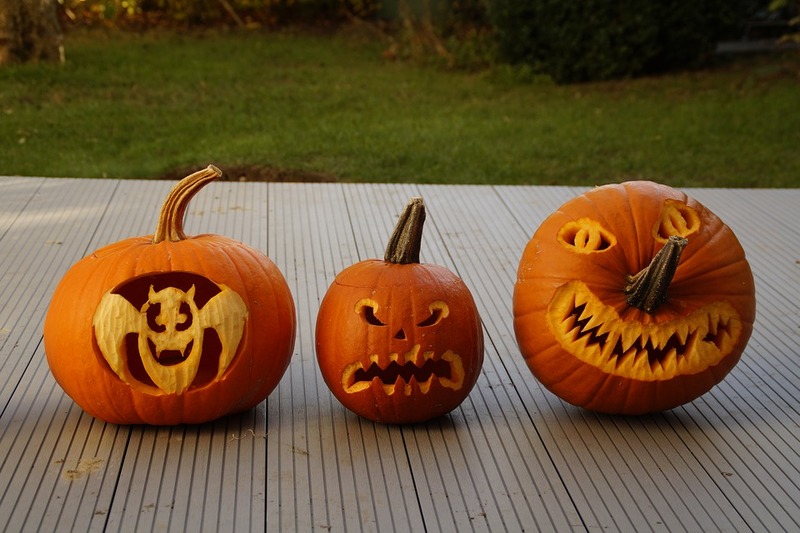 Carved pumpkins may last a week or two, while uncut pumpkins can last for a month or more. Keeping pumpkins hydrated and mold-free will prolong your designs.